Hello Stampers! This was one stamp set I didn't like at first glance. I know dragonflies are popular and meaningful...but they're still a bug. When I got this set, I realized how wrong I was. 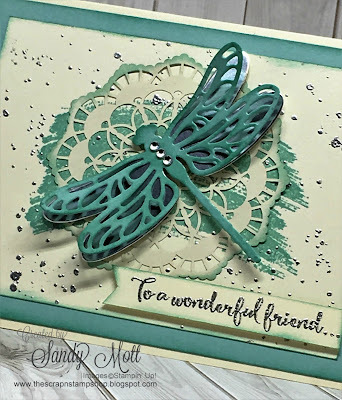 This stamp set and dies bundle is fabulous to work with. 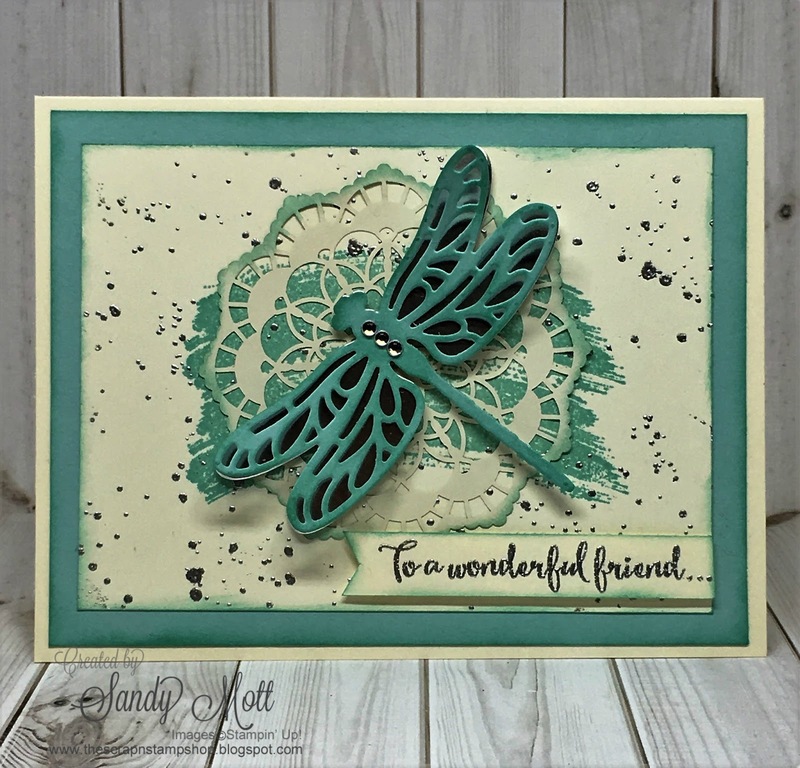 Both the detailed stamps and die-cut wings on the dragonflies are simply beautiful. I also went out of my comfort zone with this card. I don't usually use a lot of "grunge" stamps, so this was a good opportunity to dust those puppies off and make use of them. The background is Very Vanilla cardstock and the ink color is Pool Party. I used the "Work of Art" stamp set for the background behind the doily. The splatter is from the "Gorgeous Grunge" stamp set that I stamped in Versamark and embossed with Silver Emboss Powder. The dragonfly was die cut with Silver Foil, then I added the detailed dragonfly die-cut in Pool Party. The sentiment was stamped in Versamark and embossed in Silver. I sponged everything with Pool Party ink. The doily is the fabulous new "Lace Doilies" in the Occasions Catalog. Stay tuned for further information on my next product-based class in early February using this set! This is one of five cards you will be making. In the meantime, I hope you enjoyed today's post. I would love to hear from you. Great card Sandy! I love the embossed splatters:-). Pinning it!! Another WOW card! I am definitely going to give this one a try! Thanks friend! And I saw it posted - love the new color!